Ironically, the litigation between Disney and MGM occurred *because* Disney-MGM Studios became a working Movie/Television studio. But that's another page. And it's interesting to note how many Steven Spielberg influences the park has. E.T., Men in Black, Twister, Shrek (and the former Back to the Future and Jaws attractions, not to mention much of Islands of Adventure) are all his or his movie company's films. Thematically however, this park is a mess. For instance New York. New York has the attractions Twister, which takes place in the Midwest; The Blues Brothers, which takes place in Chicago; and the Mummy, which takes place in Egypt. There is a backdrop of New York, which used to be a stage for a street level Ghostbusters show, but that's long gone. Oh, and a roller coaster sticks out of one of the buildings now, too. Then you have World Expo. The Simpsons, set in Springfield someplace in the US; and Men In Black, set in New York! One area, known as San Francisco/Amity, were two divergent cities on opposite coasts. Amity is now gone, however, and is now slated to become Harry Potter phase 2. While IoA holds the Hogsworth side of Potter, USF will have the muggle side of London. These two areas are supposed to be tied together via the Hogworth Express. It sounds like a logistical nightmare on how one with only a ticket to USF or IoA (not a hopper) will get between the lands. Most of the dysfunctional themed areas in the park is due to the replacement of attractions over the years, but I really think they need to reconsider the naming of the park spaces. Maybe to names not associated with a place. 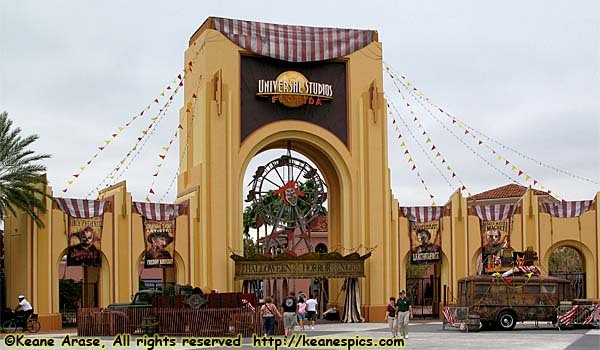 This was the original entrance to Universal Studios Florida, before it became Universal Orlando. While the major attraction here is Terminator 3-D (which incidentally has a "Making Of..." on a T2 DVD that's longer than the attraction), the Universal Orlando's Horror Make-Up Show is really a not-to-be-missed attraction. It's very well done. Oh, and I think the worst counter service food I've ever had came out of the place right across the street, Cafe La Bamba. Just sayin'. If nothing else, Woody Woodpecker's Kidzone has Universal's version of an audio-animatronic dark ride, ET. Right across the way is an animal behavior show, once a tie in with Animal Planet. Back to the Future, a staple in USF, is gone and has become The Simpsons. It's basically the same attraction, just with a different theme. Amity is gone, as is Jaws, the giant shark and Atlantic Boardwalk. It is to become the second phase of Harry Potter. 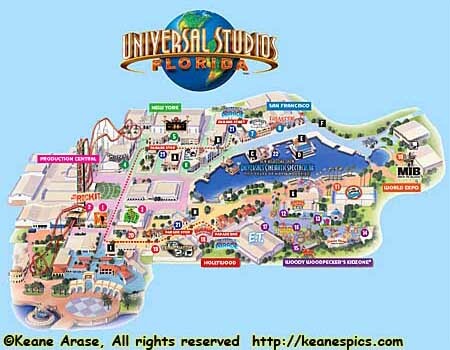 Rumor has it that a ticket to USF only will also get you to Harry Potter in IoA, but will not let you into IoA proper, and vice-versa, via a virtual train ride, "Hogwart's Express". Can you say major confusion? It will be interesting to see how it's all going to be handled when it opens. San Francisco still exists, through. It was all based around the movie Earthquake, and the attraction of the same name. However Earthquake has been rethemed to the name Disaster, with all references to the 25+ year old movie removed. Even Chuck Heston. It, like the Simpsons, is a makeover with basically all the internal stages and ride elements the same as the previous attraction in a new theme. Also in San Francisco is Beetlejuice's Graveyard Revue. I ranks high on my shows to see. Some of the performers are better than others, but it's always worth seeing. Okay, so Frankenstein plays the guitar. What's your point? New York was so named at one time because of an attraction based on King Kong that was here. It is now The Mummy, a dark indoor reversing roller coaster. Across the street, is the stage where the Blues Brothers put on regular performances. It starts with a sax player walking up Delany Street, then the Bluesmobile delivers Jake and Elwood to the stage. The performers are very good, and the sets vary from show to show. Production Central has seen a number of changes over the years, probably the biggest is the introduction of a modified out-and-back steel coaster Hollywood Rip Ride Rockit, which takes you out to City Walk, then back to New York before bringing you back to Production Central. Shrek 4-D is really Shrek 1.5 4-D, since it takes place right after the original movie. The attraction came out just before 3-D at the theaters and home video became almost mainstream, so there are plenty of poke-you-in-the-eye moments.